Receiving your monthly statement online is the safest and fastest way to view your account information. At The Savings Bank we take protecting your financial information very seriously. That's why we provide the highest level of security for our online banking products and services. And we believe that receiving your monthly statement online is actually safer than the mail. 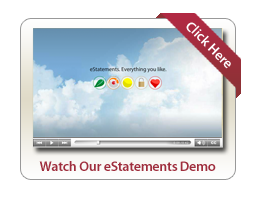 Receive, store and view your statement in a secured online environment and avoid the risk of your paper statement landing in the wrong hands. To sign up for any of our eServices products, simply go to our Online Banking page and either login with your existing access id and password, or if you are new to eServices Register now. For help with this service please call 1-800-246-2009 and speak with a Customer Service Representative.